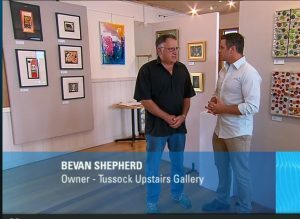 Shaun from Channel 9 television program “Postcards” interviewing Bevan Shepherd owner of Tussock Upstairs Gallery Point Lonsdale. My painting titled “Shoreline” using mixed media, is directly behind Bevan’s head! It is now in a private collection in Barwon Heads.